Robbie Grabarz (Fuzz Ahmed) was the star of the evening among the Brits at the Samsung Diamond League event in Rome with a near flawless display of high jumping. Passing on 2.20, Grabarz then cleared 2.25, 2.28, 2.31, 2.33 on the first attempts to set not only a new personal best but also a world lead. He came close on his second attempt at 2.35 but it wasn’t to be and he had to settle for a win in his first ever Diamond League appearance. 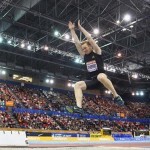 It was a good evening for Greg Rutherford in the long jump too as he posted 8.32 to win the evening’s event. 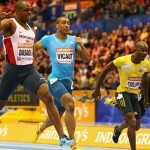 Fellow Brit Chris Tomlinson came 4th with 7.77m. Yamile Aldama (Frank Attoh) placed fourth after jumping 14.65m with her second attempt. She withdrew from the competition at that point not making any further jumps after landing badly on her shoulder. Andrew Osagie (Craig Winrow) was third in the men’s 800m with 1:44.71, his new found confidence as a world indoor medallist meaning he ran a superb race with sound tactics all the way. Nathan Woodward (Nick Dakin) finished in fifth place in the men’s 400m hurdles in a season’s best time of 49.64, whilst in the pole vault Steve Lewis (Dan Pfaff) came 5th after entering the competition at his highest ever height 5.60. He cleared this on his second attempt but failed to get over 5.72m. 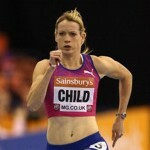 Emma Jackson (Alan Morris) finished tenth in the women’s 800m in 2:00.38, in a strong field that truly was world class. “I really enjoyed it, it was a great race, I thought I was on for a PB so I was surprised when I saw the clock ticking over to two but I can’t run a PB in every race so I’ve got to be happy with my consistency. It was such a high quality race, two world champions, an Olympic champion and all three medallists from Deagu it was great preparation for the trials as it doesn’t come much better quality that,” she said. 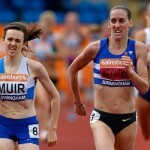 Steph Twell (Mick Woods) finished in 11th place with a season’s best of 4:09.50 in the 1500m that saw Abeba Aregawi run a world leading time of 3:56.54, whilst Jo Pavey (Gavin Pavey) ran 15:09.53 for tenth in the women’s 5000m. In the Men’s 4x100m the GB quartet of Dwain Chambers, Harry Aikines-Aryeetey, James Ellington and Leevan Yearwood got the baton round smoothly to come in second behind Canada in 38.82 secs. But in the men’s 4x 400m the GB quartet of Nigel Levine, Conrad Williams, Chris Clarke and Jack Green were easy victors in a fairly swift 3:01.76. Dai Greene (Malcolm Arnold) and Perri Shakes-Drayton (Chris Zah) were both late withdrawals to the event pulling out with a virus and minor hamstring strain respectively. Both are expected to make quick returns to competition.